. . . so it was with some surprise that I found myself watching, and actually enjoying, a documentary on the very subject on the old goggle-box last evening. It was a sort-of heart warming story of the famous goalkeeper of the 1940s and 50s, Bert Trautmann; the story didn’t always go the way you felt it should, but nevertheless was an intriguing tale of the life of someone who had been brought up in Hitler’s Germany. Now don’t ask me to recall any of the finer details, I can’t tell you who he played for, I just wasn’t interested, but I can tell you we were shown some excellent vintage film footage along with some superb sports photography shots. To be fair to football, it isn’t the only sport I hate, it’s any activity to do with a ball that has to be thrown, hit, kicked or caught and this hatred goes back a long way. As a child it has to be said I was not the most athletic, in fact puny would be a better description and therefore my body was not best built for contact sports. In addition I was not terribly well co-ordinated and had difficulty throwing and had even more of a problem catching anything that came my way. It was inevitable then that I began to avoid any games that involved aerial projectiles. In junior school the class teacher would choose captains for the teams, and then the captains would choose their players; it can be very demoralising to be the last or pen-ultimate one to be chosen as part of a team, my friend R E and I would usually be in this category; he like me was was also sportily challenged! In senior school I avoided games as best I could, usually hiding in the roof of the school shower block, a place that was never discovered. Strangely, my brother who is three years younger also hated games, but his hiding place was under the stage in his school, a fact I only discovered a few days ago. I guess my brother and I were a bit of a disappointment to our father as far as sporting interests go as he liked any ball sports from rugby to snooker, but particularly cricket; now there’s a game to get your head around, just what is that all about? In school, the best position I ever played on the cricket field was left outside! Seriously though, what’s the point of have someone in your team who couldn’t catch? I was always relegated to the farthest outpost of the pitch where there was little or no chance of a ball coming my direction; if one did I would pretend I hadn’t seen it until the last moment and then run down towards where it had rolled hoping someone would beat me to it so I didn’t have to throw it – did I mention I was hopeless at throwing as well? Thankfully though, life and one’s future doesn’t depend on your prowess on the school playing field and I have managed to survive my life without having too much involvement with ball sports; I’d like to tell you I’ve never been on a sports field since my school days, but that would be a lie, I’ve even attended a major football game at a stadium and a cricket match with famous players, but don’t ask me who was playing, not a clue! 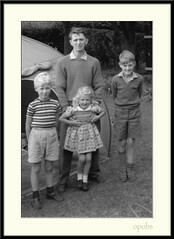 It would have been good to have illustrated this little tale with a picture of me in incongruous sporting kit, but as you’ve probably guessed, there are none, so have included this old photograph of my brother and sister and myself with our father on holiday in 1962; interesting to see I’m wearing school uniform minus the tie! This photograph is linked to my flickr site and will open in a new window where you will be able to find more photographs of me as a kid! Lovely story Mike, and one that I can relate to, I have to say that I was pretty much the same as you when it came to playing any sort of ball game and I also never got picked which used to anger me then, but in retrospect I can quite see why!! Regarding the sports you mention, Football, a good game to watch, just very sad that to play it properly, these days you have to have attended drama school! Cricket is about as interesting as watching paint dry, except for the 20/20 games which can be great to watch. Rugby, a great game, not that I ever played it, but a game of great skill played by real men, not prima donnas, ( as in football ) a superb game to watch and certainly to photograph, especially the full contact shots!